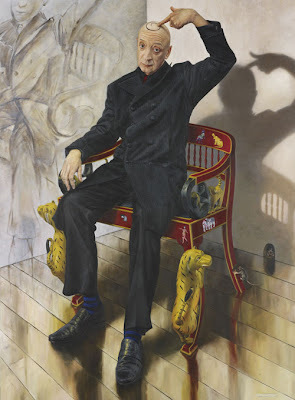 There's a certain pleasure in the Archibald Prize, now showing at the Art Gallery of New South Wales. Like a second hand bookshop or the internet if we search through an awful lot of dross hard enough we might find the pearls that lie within. 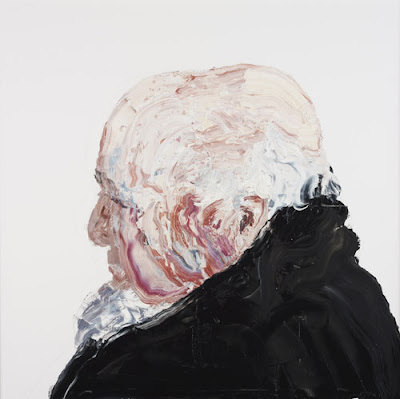 The problem with the Archibald is always its attempt to resolve the artistic merit of individual works with the crowd-grabbing celebrity of the sitters. The prize describes itself as being for "Best portrait painting preferentially of some man or woman distinguished in art, letters, science or politics" (sic). That pretty much describes anyone who has hung around a gallery, can pay for a portrait or can paint themselves whilst looking in a mirror. Some of the works here are wonderful and unexpected. Sam Leach has produced a jewel like cabinet piece amidst all the acres of portentous canvass. 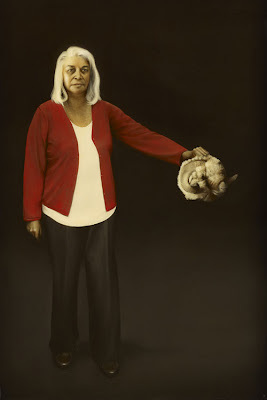 His portrait of Marcia Langton alludes to the classical, the Golden Fleece and Cain and Abel are all in there, but his real connection is through technique rather than aesthetic of reference. Leach fetishises oil paint, and his love of seventeenth century Dutch virtuosity is worn proudly but lightly on the canvass. He produces a luminous blackness perfectly in tune with his subject. The quiet ambiguity of the piece, its hint of memento mori, lead us into the truth of portraiture, we can never know someone too well, we can only hope to capture the hints of what we don't know. The depth lent to Leach's work through this beautifully realised ambiguity is entirely different to the glib paradox and oxymoron of so much post-modern art and is both sincere and powerful. Surprisingly interesting, given that it represents a politician and a cause, is Richard Onn's 'Coupe SX010F', a canvass triptych of Bob Brown. Here the Tasmanian Green Senator is presented mock heroically, standing in cruciform tension between the forces of industry and nature. There is a lovely contrast between tree and logging truck, between bark and chrome. At the same time Brown's face, despite being a little overpainted to the point of appearing airbrushed, could be an old growth forest topography. The work is a classical portrait in the history painting mode. What does strike you more than anything is the sheer size of much of the work, close cropped heads that would cover the wall of most rooms outside of a gallery. These massive portraits, near billboard size, remind us of the debt of painting to photography. They give themselves up immediately and cheaply, each broad expressionist stroke and smudge. Across most of the works any sense of human scale has been well and truly lost, even the winner Guy Maestri's 'Geoffrey Gurrumul Yunupingu' looks like a monumental Easter Island statue, hinting at his album cover rather than what we don't know or haven't seen. This trend to massive overpowering faces is self-aggrandizing portraiture rather than revelation. However one large scale painting that does make a virtue out of size is 'Mountain of Tom', by Paul Ryan, the pink tremulous screeds of paint capture and bubble with Thomas Kenneally's exuberant fleshiness. There is some really bad painting to be seen here. Work that is both technically sloppy, conceptually asinine and desperately derivative. Some deserve to be highlighted. Anthony Bennett can stand for all of the painters in the show who use the magazine clichés of street art dripping, blotting and scribbling. His eminently stupid picture, 'self portrait in the bathroom discussing beauty, bukowski, and brett whitely with my ex, now a stripper, who likes to dress as wonder woman' does at least give us a chance to avoid it, that is if we subscribe, as I do, to the rule that the length of a painting's title is likely to be inversely proportionate to its quality. Bennett's trendy bag of fauxhemian references would make a Year Twelve student ashamed, just as he takes pastiche and derivativeness to a previously forgotten level. He really doesn't deserve the encouragement that inclusion might give him. Poster boy for photo-realist kitsch is 'Brendan' by Vincent Fantauzzo. The portrait has that level of realism that leads us to 'the uncanny valley' (Masahiro Mori's hypothesis that increased 'realism' in computer representations of humans causes revulsion in onlookers). So shiny is it that it feels sacharine and calculated, not a good look for a young boy. 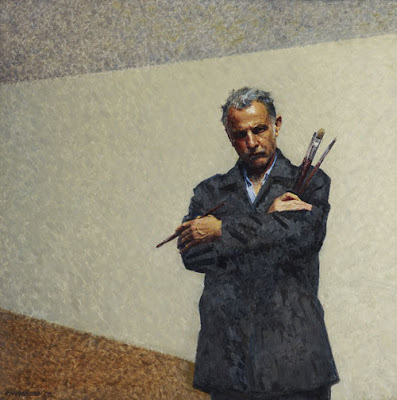 In the realm of painterly self-portraits Robert Hannaford's stands out in its restraint, human scale and stoic sensitivity. It's hung close to Peter Hanley's hommage to Titian, the original is, perhaps, the apogee of an artist's self portrait and the hubris in copying something that Rembrandt has already copied (as have so many artists) does win points for bravery. Sadly the painting is a little too aware of its own limitations and is neither brilliant enough in technique or bravura enough in conception to be more than dull. This year the Packing Room Prize was closer to getting it right. 'Flacco's Chariot', by Paul Jackosn, is an interesting painting about someone of whom I know little. I see an ageing man perhaps clinging to a character who has taken him into the public domain. On the framing walls behind the sitter are an oil sketch and a shadow, the genesis and exodus of a dramatic personae. Out of the shadow, and a cartoon mousehole on the skirting board, come mice, gnawing away at the chair legs. It's a surprisingly beautiful and melancholic work that rewards viewing. That the Archibald should attract round the block queues is an unalloyed good thing. Bringing more people into a gallery is not a victory in and of itself, we ought to be more ambitious than that. A wider public should also place a further pressure on the judges and the gallery, this is an opportunity to educate (an unpopular word, I know), not just a popularity contest, and more could be achieved with hanging and glossing the pictures. At present we get some artist blurb and a biography. If the judges were confident in their choices they could begin to explain why some of these works deserve inclusion or perhaps explain the artistic merit of pieces, you only have to look and listen how people absorb and discuss the information there now. Tens of thousands of people arrive in the Domain in nothing like the supine philistine state the art establishment often ascribe to them, a real legacy for the Archibald would be to give them even more of what they want, not celebrity, but art.